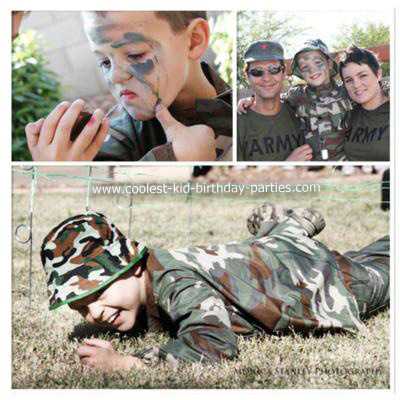 I wanted to do something very special for my son this year so I went all out and surprised him with a Bootcamp Birthday party. I created the invitations and fashioned them after actual WW2 draft cards, they actually turned out awesome, everyone thought I had them done professionally. I put each child’s name and address on them as well as issued a separate number for each invitation. I also created exclusion dates like real draft cards. The children arrived in camo, it was great! We also teased the kids telling them we were going to shave their head. They laughed. My husband and I even built a climbing wall in the backyard as a part of the bootcamp obstacle course. When the children arrived, I issued their Dog Tags with their name on it as well as a camo bootcamp hat. Then it was time for the Bootcamp Obstacle Course. I wanted to actually have a drill Sargent come to run them through the course but I couldn’t find one so Thaddeus and I purchased attire from an Army Surplus store to look the part. We timed each child as they ran through the course consisting of this: Eight tires to jump through, perform a soldier crawl under wire for 5 feet then climb the wall and run over a balance beam then shoot the Nerf at one target, run around cones and shoot the second target! They had an absolute blast!!! The fasted time won a prize, $5 gift card to Toys R Us. Then we prepared for our big mission, to Save Private Ryan! We created two teams, Team A and Team B.
I had prepared clues within the neighborhood for the kids to find and figure out riddles to find the next clue and even made them decode a secret message. I stuffed one of my son’s Army costumes which we used as “Private Ryan” and hid him in the neighborhood. The winning team won a prize and it was great to see that my son actually found and saved Private Ryan. He was so happy! 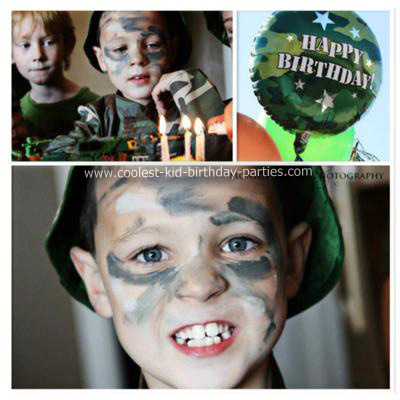 Then it was time to apply the camo face paint and eat and do the cake/ gifts. After that my son organized a huge Nerf war out front. When the parents came back 3 hours later the kids didn’t want to leave. 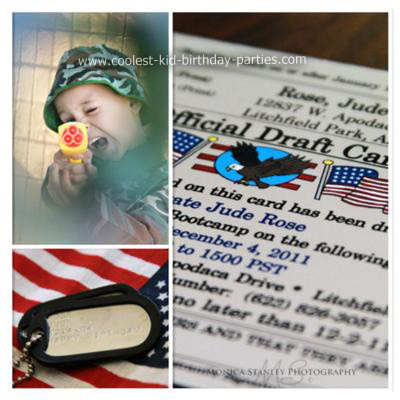 We issued my son a custom pair of Dog Tags that had his name, date of birth and Happy Birthday on it. 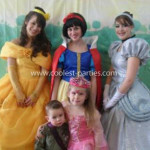 We were told by the kids and the parents that it was the best birthday party ever! All the kids left with a camouflage backpack sack filled with goodies. When the kids were leaving, they were issued a Sharpshooter card, a Hero medal and an Honorable Discharge certificate. For the thank you’s, I included a picture of each child participating in the obstacle course, this was a generic card for the submission. No details spared. By far the BEST party EVER!! Alexander had a blast! You totally outdid your self!! Amazing! Fantastic. I am sure you’ve made their day…. What a great idea, I am going to have to steal it!! I was showing the pictures to my 6 & 4 year olds, now they want a bootcamp party. Great idea!!! 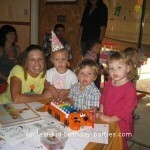 I am amazed at the time you took to devote to your sons birthday party! It really is one of the best parties I have ever seen. I really love your invitations…my party was not as cool but I did have great invitations from yellowlemos shop on etsy. Anyway I vote your party is super cool. Thank you to everybody who voted and made such wonderful comments! I really wanted to do something special and we all just had a blast! Jude said it was his favorite party! I LOVE looking at sites like this when getting ready to plan a party. Thank you for sharing your ideas and all the fun had by all. Very creative you guys!! Jude is so cute!! What a great idea, Kim! Way to go, Private Rose! Your efforts seemed to have paid off. All looked like they were having fun making great memories! This is awesome! I really liked the idea. Hope you won’t mind if I share it with my sister-in-law who will soon organize a birthday party for her son this coming October. Chris V. – Thanks for the wonderful complement! I hope your sister-in-law has as much fun as I did organizing and planning the party. I’m very flattered you shared this with her! I love everything you did. My son would give anything to have a party like this. He loves everything that has to do with Army and camoflauge themes. I would love to do something similar the only thing is that my son’s birthday is in the winter. Do you have any suggestions? This was awesome! I am working on an invite for my nieces boot camp going away party… And would love to use this idea by any chance do you have a template for the invites… This would be great! Thanks for any help! Where did you find the camo boonie hats and the net pictured? I have been looking everywhere for those items!! I got the cammo hats and the net from a party favor website. I thought I had mentioned the site in my story but maybe I forgot to. They weren’t that expensive and they were easy to find online. Just google them and they should pop up. Thanks for the great complements! Fantastic. I am sure you’ve made their day…. Good job. Well done. party. I’m very flattered you shared this with her! anything to have a party like this. He loves everything that has to do with Army and camouflage themes. I would love to do something similar the only thing is that my son’s birthday is in the winter. Do you have any suggestions? they should pop up. Thanks for the great complements! I need the honorable discharge papers. Did you make them or order them? Also the sharpshooter card did you make those?